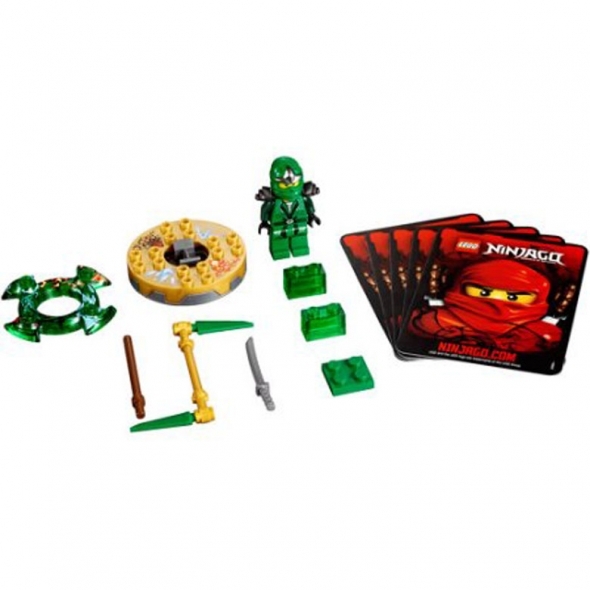 The LEGO Ninjago Lloyd ZX Play Set features the popular LEGO Lloyd ZX — the legendary green ninja — and a collection of game pieces for play with friends. The play set includes a variety of battle cards that can be used to play the Spinjitzu game. Also included in this LEGO Ninjago Play Set is the Lloyd ZX minifigure, a green crown, LEGO bricks, a golden weapon and two regular weapons. And for the Spinjitzu game, in addition to the battle cards the LEGO Ninjago Lloyd ZX Play Set contains a gold spinner and a character card. The LEGO toys included in this play set can be used either for traditional play with LEGO building blocks or for the competitive Spinjitzu game that can be enjoyed with friends.